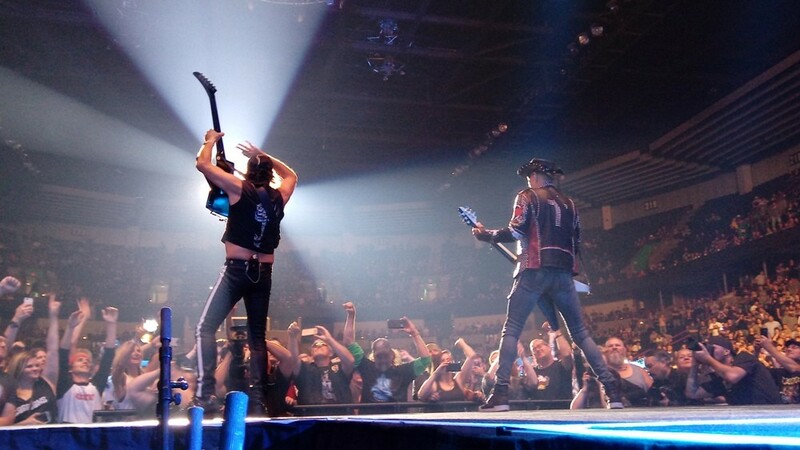 With more than 85 years of touring and recording experience at the Spokane Arena Friday night between the respective careers of the Scorpions and Megadeth, one could be forgiven for thinking the guys on stage wouldn't be able to deliver the same kind of show that made them arena-filling rock stars. Instead, both bands exceeded expectations. They might rely a little more on killer graphics flying across massive video screens than their own ability to scamper all over the huge stage, but the sound remains the same for both, whether you're talking about the pop-tinged hard rock of the Scorpions or the intricate thrash riffs of Megadeth. The Scorpions headlined the festivities, and rather than simply churn out a greatest-hits set, the German crew that originally formed in 1965 joyfully delved into some deep corners of their catalog, like a medley of pre-American-fame '70s tunes ("Top of the Bill/Steamrock Fever/Speedy's Coming/Catch Your Train") illustrated with an explosively trippy, colorful set of visuals that captured the tinges of prog-rock peeking through the music. They played three songs from their 2015 release Return to Forever (show opener "Going Out With a Bang," "Rock n Roll Band," "We Built This House") and of course hammered the show home with a barrage of their biggest hits from the MTV era; the set-closing "Blackout" and "Big City Nights" led to an encore of "No One Like You," "Still Loving You" and "Rock You Like a Hurricane." Matthias Jabs (left) and Rudolf Schenker get close to the crowd. 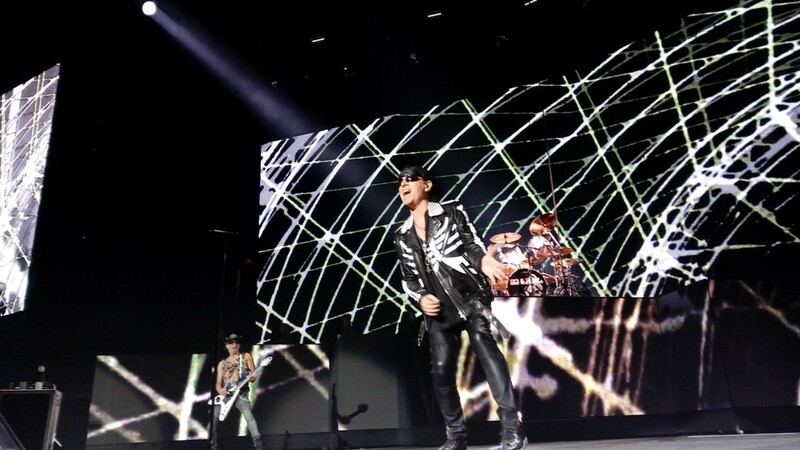 Lead singer Klaus Meine sounded pretty solid all night. He might not be as athletic as the old days (the dude IS 69), but he still has the charmingly thick German accent when he goads the crowd with well-worn lines like "Spokane, there is no one like you!" And he bangs a mean tambourine, too. Guitarists Rudolf Schenker and Matthias Jabs sounded great, and the band's "new" drummer as of 2016, former Motorhead man Mikkey Dee, led the band through a nice cover of his former crew's "Overkill" as images of Lemmy flashed on the screens. 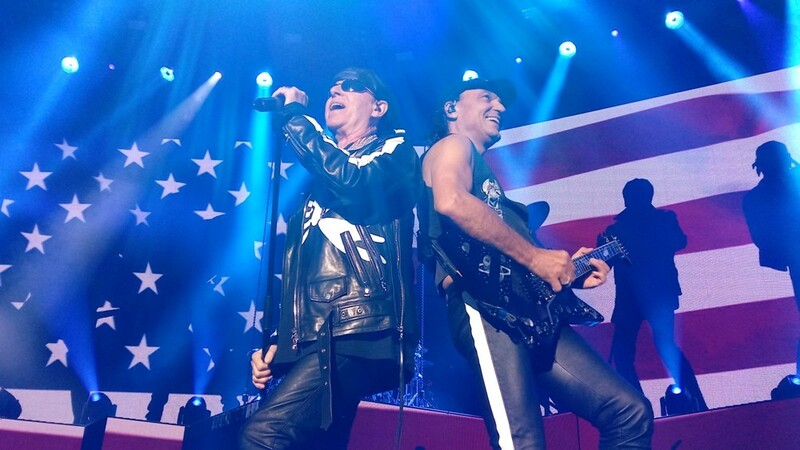 It was a polished, professional show by guys who have been filling arenas since the late '70s, and the Scorpions show no signs of slowing down. 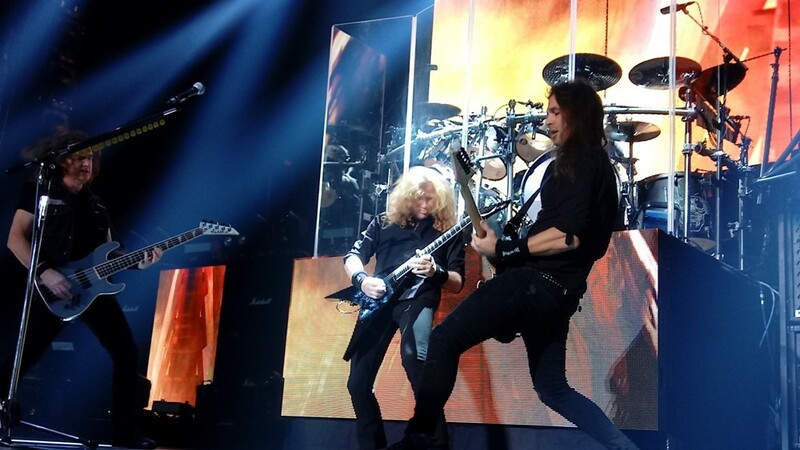 Megadeth on stage Friday at Spokane Arena. The same goes for Megadeth, a headliner in their own right most of the time. Led by fire-breathing leader Dave Mustaine, the quartet tore through 11 rapid-fire songs abetted by disturbing and fascinating animation and video clips. 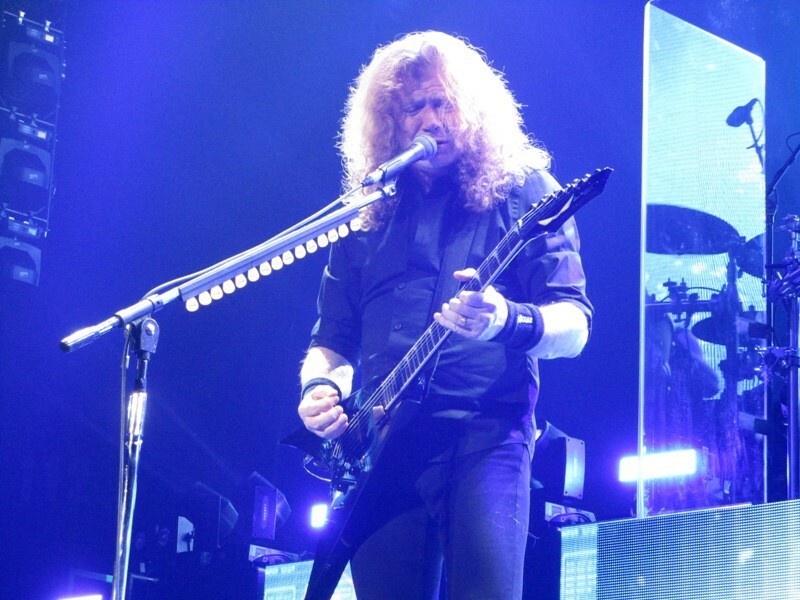 Mustaine isn't much for chit-chat on stage, letting his fingers do the talking as the band tore through songs like opener "Hanger 18," "Mechanix," "Sweating Bullets" and the Grammy-winning title track of last year's Dystopia album. 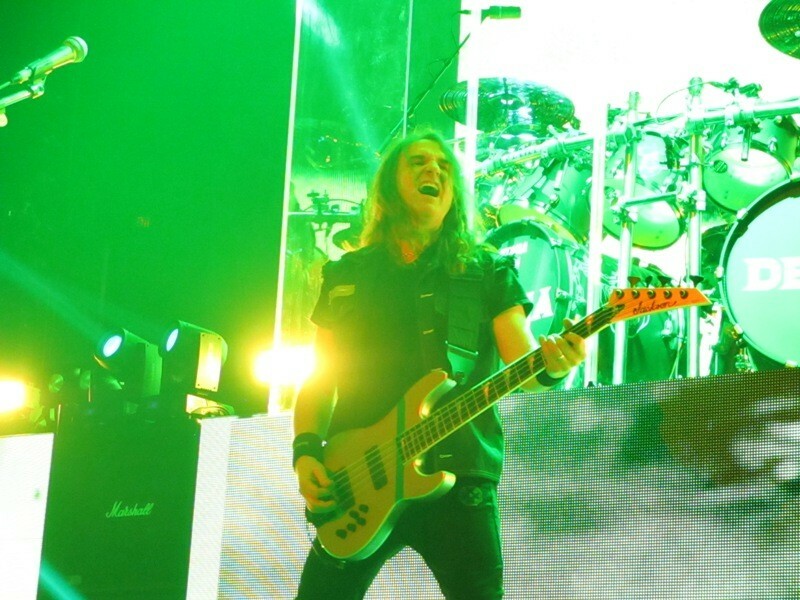 With longtime bassist Dave Ellefson grinding out riffs and providing backing vocals, Megadeth proved there's still a lot of fire in the band after years of turmoil and lineup changes. 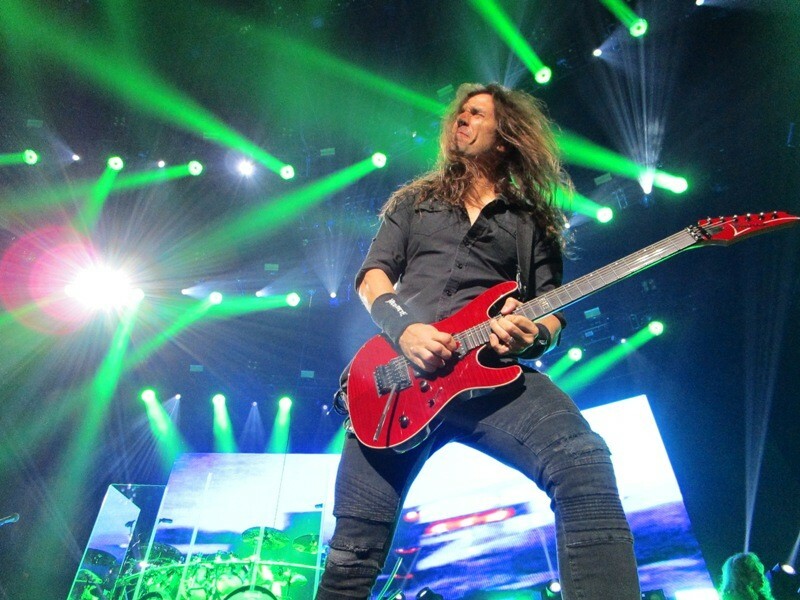 Lead guitarist Kiko Loureiro proved an ace six-string foil for Mustaine. 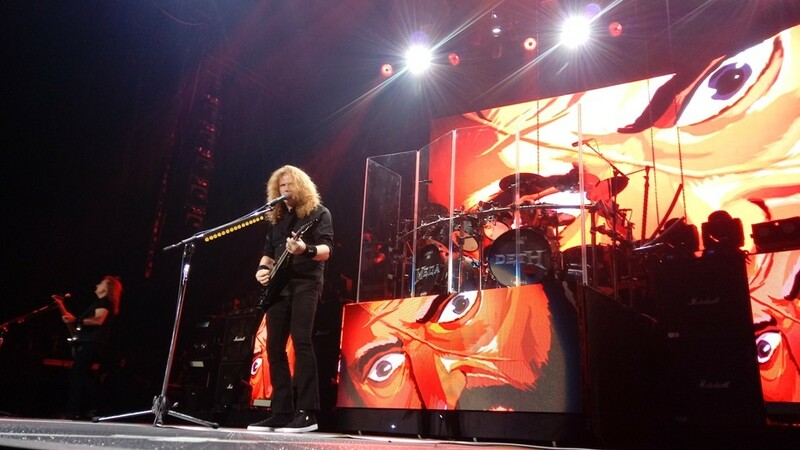 While Megadeth's whole set was rock-solid, the closing burst of "Symphony of Destruction," "Peace Sells" and "Holy Wars...The Punishment Due" was a brilliant distillation of what makes them a great metal band. The fact they had the vast majority of the audience on its feet throughout their set showed Megadeth is far from a typical opening act. 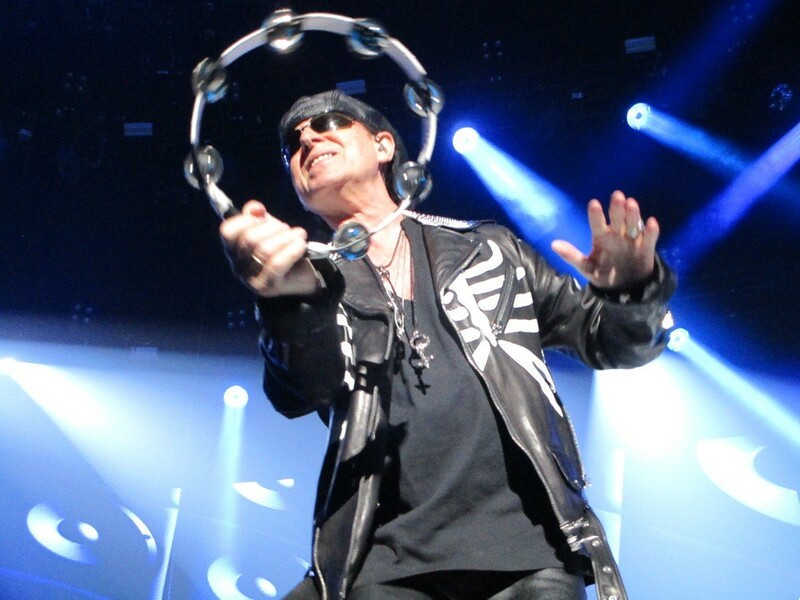 The Scorpions' Klaus Meine still loves a tambourine. 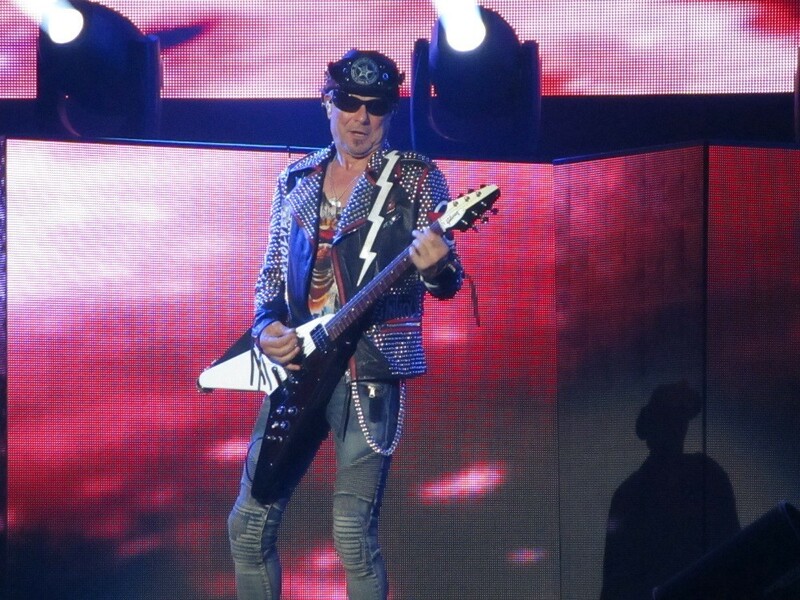 Rudolf Schenker founded the Scorpions in 1965, and he's the only band member who's been there since the beginning.